Hope you all are having a lovely week thus far! I have been in training for my job the last few days, and let me tell you I’m happy it’s over lol. 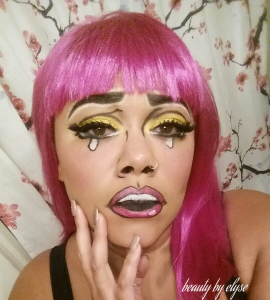 Today I’m going to show you my “pop art” comic book Halloween makeup I did over the weekend. Two of my supporters on Facebook tagged me in the same YouTube tutorial video for this look, so I decided to give it a try.